Thank you so much for your interest in subscribing! I feel honored to come along beside you with these weekly mentoring emails! My prayer is that each email, and each post here at the blog, will provide inspiring, practical ideas to help you live and love well. New blog content sent straight to your inbox (about once-week, always on Friday mornings). Free, printable worksheets that correspond with each new post on the blog- to help you with the practical sides of living and loving well (once-a-week). A personal, mentoring email from Kristy (about once-a-month). Exclusive access to e-courses and guides (any time they are available). Money-saving promos from companies this community of readers loves (a few times throughout the year). My recommended reading on the topics we explore often at the blog (I try to write one book review per month). First dibs at at upcoming series, products, or promos (a few times throughout the year). 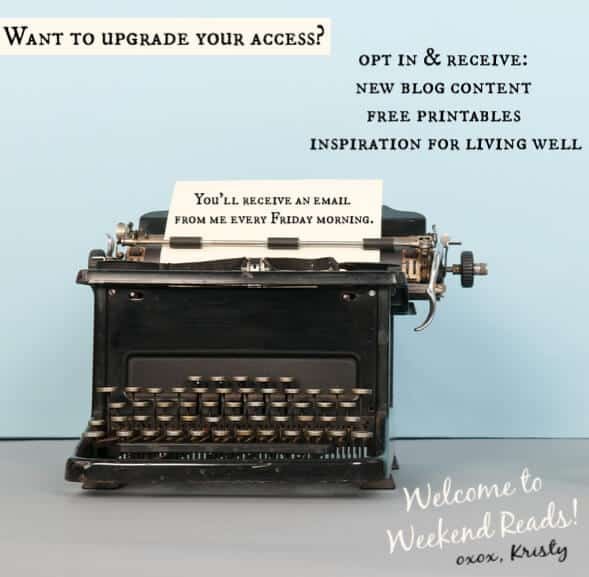 Simply upgrade your access by opting in to my new weekly mentoring email: Weekend Reads. I'll send you my exclusive subscriber-only content every Friday morning at 7:00 CST. If at any time you decide Weekend Reads is no longer a good fit for you, you can always unsubscribe. Again, thank you for being a part of this community of Christian women. I'm really honored to come along beside you with a weekly mentoring feature. 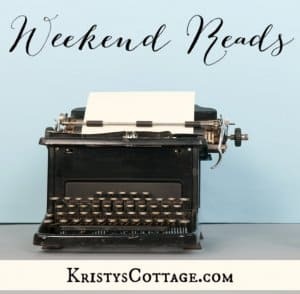 Look for your "Weekend Reads" to hit your inbox every Friday morning around 7 AM, CST. If you have a friend or sister who would benefit from the topics we discuss here at the blog... please hit a "share" button and help spread the love. Isabel, I’m so very sorry! I’m currently experiencing a glitch with my subscriber service, and my subscriptions are frozen right now. I hope to have this issue fixed ASAP. For now, please email me via the contact page and I will send you the subscriber freebie. UPDATE: Isabel, my developer has addressed the subscription issue… it’s working now! Please let me know if you have further issues submitting your info in the subscription form. Thanks again for reaching out about this!